This book tells the story of the flying wing and Jack Northrup. There have been many myths about all-wing aircraft and some confusion. The author has done a good job in providing a clear narrative, supported by some excellent photographs and drawings. There were all-wing aircraft flying before Northrop began what some considered a flying wing obsession, but he was dogged and determined, providing the basis on which the B-2 Spirit was eventually to be designed and built by Northrop Grumman. 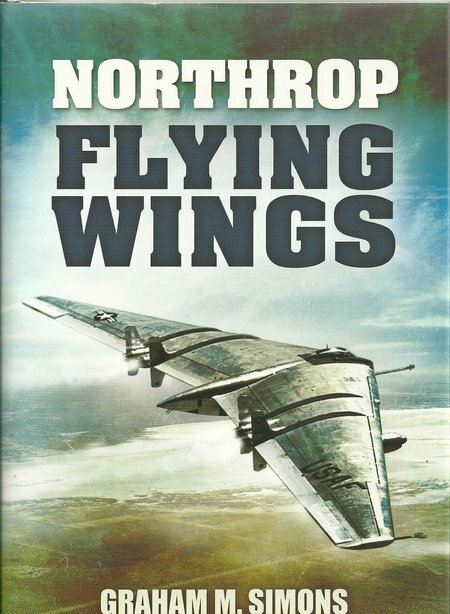 DESCRIPTION: This book tells the story of the flying wing and Jack Northrup. There have been many myths about all-wing aircraft and some confusion. The author has done a good job in providing a clear narrative, supported by some excellent photographs and drawings. There were all-wing aircraft flying before Northrop began what some considered a flying wing obsession, but he was dogged and determined, providing the basis on which the B-2 Spirit was eventually to be designed and built by Northrop Grumman. In less than 15 years the design of aircraft had made unbelievable advances from the simple powered box kite that the Wright Brothers built after several years of experimentation with box kite gliders. In those early years, aircraft design fired off in all directions with lighter-than-air vehicles being considered the most promising route for development. Every possible configuration was tried, many failed, and some worked but were abandoned for no obvious reason. The biplane box kite was relatively simple to build, using the available wood and canvas materials. The major challenge facing all early heavier-the-air vehicle designers was in finding a suitable power plant. It was also a challenge for airship builders, but they did have the option of hanging several engines off the envelop or mounting an engine in each end of a control car under the envelop. They had the advantage that the very much larger airship could carry a larger crew, including engineers who could make their way to an engine and repair faults in flight. For the first heavier-than-air vehicles, technology was hard pressed to carry a two-man crew and most early aircraft carried just a pilot. The first basic consideration was whether a new aircraft should be equipped to take off and land on water, or fly from aerodromes on land. As aerodromes were few and far between initially, a land plane had to be capable of using any suitable flat area without obstructions. Some designers hedged their bets and designed amphibians. Some of these were flying boats with wheeled undercarriage, but most were floatplanes that included a main wheel in each of the two floats. Having decided what the aircraft would fly from, the designer had a very wide choice of wings and layout. Multi-planes could achieve relatively short take off runs, climb rapidly and were agile. Against that, the more wings, struts and bracing wires, the greater the built-in head wind in the form of high drag. Rapidly, the biplane emerged as the most popular wing form because it was a compromise that worked. It had reduced drag but was still able to make use of the early fragile materials. Between the two wings, there was a fuselage that contained a single engine, a pilot, perhaps the luxury of a passenger or observer, and either contained the fuel tank, or perhaps a working fuel tank fed from a larger tank in the upper wing. The tractor engine was most popular, although some aircraft employed a pusher behind the pilot. The latter configuration made design of the tail surfaces more difficult because of the pusher prop between pilot and tailplane. There was also wide choice in providing control surfaces to change the aircraft’s attitude in flight. As aerodynamics was an evolving science, many early aircraft used control systems that were less than efficient. Some early aircraft even relied on the pilot warping the wings by winding in cable from the wing tips to a drum beside him. Many early aircraft responded slowly and poorly to controls and this accounted for most of those crashes that were not caused by engine failure. Of course a few designs broke up before they achieved flying speed and others broke up in flight on during landing. Given all of these many options and a lack of real knowledge, aircraft in some bizarre configurations took to the air and some even stayed up there until the pilot wanted to return to the ground. There were a few monoplanes but they were rare until the 1930s, although that was still only three decades after the first hesitant flight. Steadily in the 1920s, designers began to move towards a popular configuration that accounted for most of the aircraft built and the huge numbers of aircraft built during World War Two. By now, wood was rapidly being replaced by metal and the aircraft was rapidly evolving from a skeleton clad in metal to a monocoque form where a complex metal structure achieved great strength at low weight. By this point, most aircraft had a fuselage, ending in a tailplane, and with the single wing attached and faired into the fuselage at the point of balance, either low on the fuselage, at the mid point, or on top of the fuselage. A single engine was mounted at the front of the fuselage with a tractor airscrew/propeller, and some aircraft then increased power by also mounting two engines in the wings, before a standard configuration saw multi-engine aircraft having the engines wing-mounted in two, four, six or eight units (and in a few cases mounting ten engines in back to back pairs above the wing), sometimes with pairs of engines driving a single propeller, or each engine driving a pair of contra-rotating propellers. The rudder was mounted on a tail fin as part of the tail plane, and elevators were mounted at right angles on either side. This tail plane controlled turn, dive and climb and the great advantage was that the size of these control surfaces could be increased from experience of test flying prototypes to produce the manoeuvrability desired. The wings then carried the ailerons to provide the ability to bank the aircraft. As the control surfaces increased in size and required greater force to operate them, trim tabs were developed on the control surfaces to assist the pilot. Landing speeds and weights increased and this led to leading edge slats and trailing edge flaps to improve landing and take-off characteristics. In a small number of cases, canards were added near the nose in place of tail mounted elevators and planes. One reason for this was to improve the pilot’s forward and downward view, that could be obscured by the main planes. With aircraft flying higher, faster, and in colder conditions, the open cockpits of early aircraft were replaced be cockpits covered by clear Perspex canopies. More clear domes and blisters were added for navigators, observers and gunners. When the jet engine arrived, the basic popular configuration continued with little modification. The noticeable changes were the introduction eventually of wing sweep and the jet engine was either attached to or under the wings, or set behind or below the crew, with an exhaust pipe emerging under the tailplane. As this general trend developed, becoming the most common configuration, designers continued to periodically produce all-wing aircraft. In Britain and Germany a number of glider and powered aircraft were built in this form, but nowhere was any designer as persistent as Jack Northrop. There have been several claims as to why an all-wing aircraft is superior to any other configuration. One justification is “Stealth” which may have become valid after the introduction of radar but is not really a motive for early all-wing designs. Early all-wing designs were more accurately described as tailless aircraft in the sense that the traditional long fuselage and full tailplane was missing, but there was usually at least one fin with a rudder, or large wing endplates, some of which included a rudder. In most cases, the wing(s) was/were either completely swept as on the Dunne D-8 of 1916 that served the US Army, or had a swept leading edge, as was common on Northrop’s designs. The German Komet rocket fighter is one example of a flying wing that had a large conventional fin and rudder for stability and for turning the aircraft. Other German WWII designs, such as those by the Horten brothers, were all-wing designs with the pilot accommodation faired into the wings. The common justification for early all-wing aircraft was that they would induce lower drag than any of the popular configurations, but there were limits. All-wing aircraft are generally larger than other contemporary configurations for a common application. That made the all-wing aircraft much more visible. It also faced challenges in providing adequate and reliable control systems. In Northrop designs, several included wing fences and stabilizing fins. The jet-powered B-45 had its clean surfaces marred by wing fences, eight large stabilizer fins, in pairs above and below the wing, two under-wing pods for additional turbojets, and a fuselage that projected aft of the wing trailing edge. As radar signatures were already becoming important considerations, this degraded claims of “stealth” ability and there were conventional configurations for bombers that achieved lower radar signatures and lower drag. They were also generally easier and cheaper to build than the Northrop design, with higher performance. Northrop faced challenges in finding suitable power plants. His earlier designs required at least one pair of engines, driving pusher propellers. The early smaller machines also had a pronounced pod to accommodate the pilot. Consideration of reduced profile by having the pilot prone on a couch had be used by other designers in convention configurations, where lower profiles, and a belief that this pilot position was better in high G manoeuvres were considerations, failed to become popular. This is also part of the reason why those advocating all-wing designs faced difficulties. For such a dynamic industry, aviation has also been remarkably conservative. The biplane survived far longer than it deserved as the mainstream popular configuration. The propeller was one reason why early jet development achieved lower support than it deserved, and the radical appearance of the all-wing designs again offended conservative taste. Even when the increasing use of radar for surveillance and to control anti-aircraft weapons should have made “stealth” very attractive for military aircraft, air forces insisted on hanging weapons under wings, creating the maximum radar signature for a warplane that was then expected to operate in hostile war zones. The Northrop all-wing configuration has only recently achieved a real adoption and variations of the configuration are now becoming commonplace. The B-2 Spirit has achieved full operational capability with the USAF as a strategic bomber, capable of carrying conventional and nuclear weapons long distances without refuelling and longer distances with aerial refuelling. It is a genuine all-wing design without any form of tail surfaces and it benefits from earlier experience of stealth aircraft, such as the F-117A, which has twin fins but is otherwise an all-wing aircraft. Although anti-insurgency UAVs tend to follow conventional configurations, most jet-powered UAVs are essentially flying wing designs with the accommodation for internal weapons bays being faired into the wing structure. However, the load capacity of all-wing designs is still a limitation. The B-2, for example, has yet to achieve more than half the bomb load achieved by the B-52 that it was intended to replace. This may not be a major issue, although for some aviation conservatives, it is measured against the very elderly B-52 and found wanting. What has yet to be experienced are the advantages and weaknesses of the B-2 in a hostile war environment. So far, it has been used in target rich environments where the USAF and its allies have complete air superiority and even WWII four engine propeller aircraft, such as the Avro Lancaster would have been effective bombers with the ability to carry a 10 ton earthquake bomb or a similar load of mixed iron bombs from 500lb and large numbers of incendiary bombs and anti-personnel bombs. The author has provided a comprehensive review of Jack Northrop and his all-wing designs, placing them in perspective against attempts by other all-wing enthusiasts to produce viable aircraft in this configuration. This is an important study of a very interesting type of aircraft and the photographs and drawings are first class, making this an information, entertaining and enlightening book.